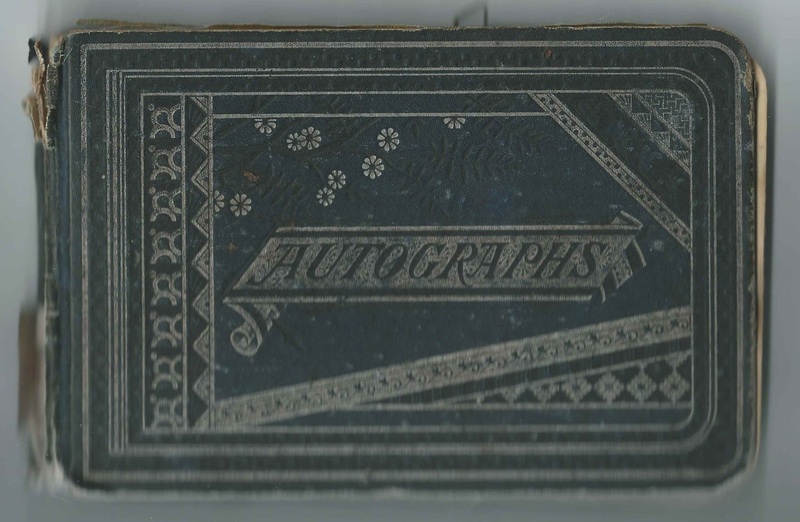 1880s autograph album of Frances Isabelle Marriott, "Frankie", of Hardin County, Kentucky. 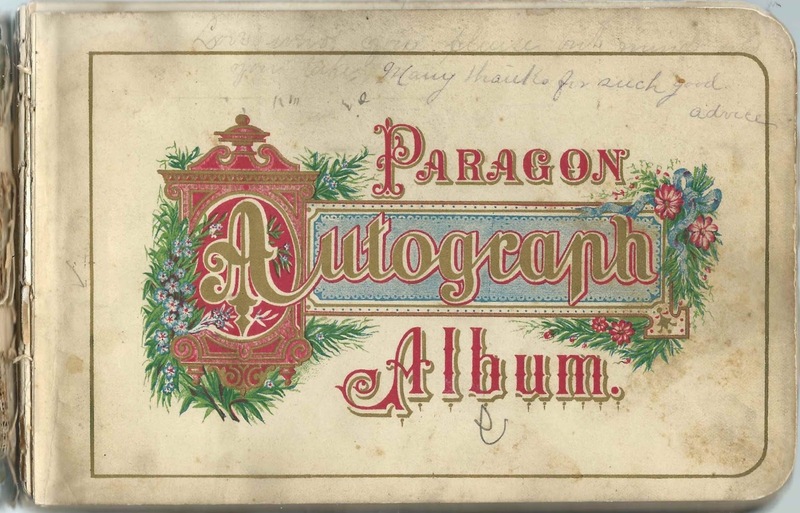 Surnames in the album that appear multiple times: Alvey; Bethel; Hayden; Heller; Kerfoot; Marriott; Mossbarger; Sullivan; Sutzer. Frankie would later marry Benjamin Hardin Alvey, Sr.; two of their sons inscribed pages in the album when it came to light in a later era. Those pages are shown farther below. The title page has handwriting: "Love who you please but mind who you take. Many thanks for such good advice". The album measures approximately 7-3/4" by 5" and contains the sentiments of about 66 of Frankie's relatives, friends and schoolmates. An alphabetical surname list and an alphabetical list of the inscribers, together with any personal information they offered, appear at the end of this post. This bookmark from the California Fig Syrup Company is enclosed. Frances Isabelle Marriott, "Frankie", was born July 22, 1865 at Elizabethtown, Kentucky, the daughter of John Belt Marriott and Amanda Ellen (Smith) Marriott. 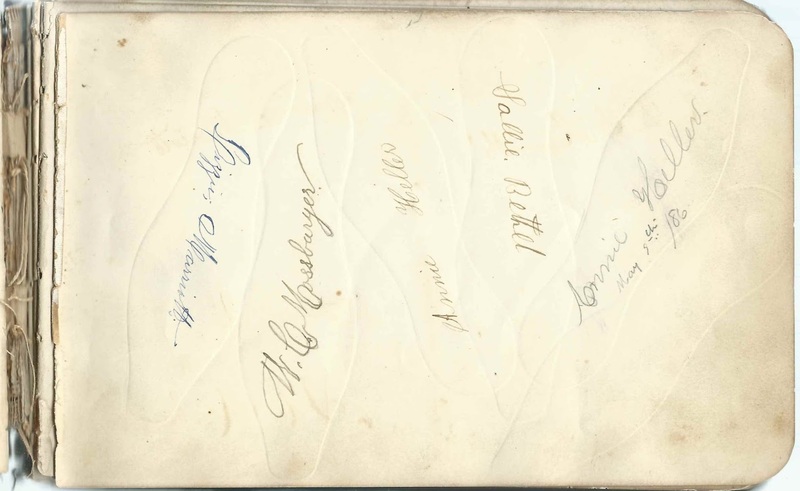 Frankie had, I believe, five siblings, four of whom inscribed either shared pages or individual pages in the album. Lou A. Marriott; presumably Frankie's sister Louisa A. Marriott, who would marry Miles Hardin Miller. John B. Marriott, Jr.; Frankie's brother John Belt Marriott, Jr., who would marry Kate Goodman. Maggie E. Marriott; Frankie's sister Margaret Ellen Marriott, who would marry Henry A. Sutzer. Lizzie Marriott; possibly Frankie's sister Elizabeth M. Marriott, who would marry Willis Woolfolk Long. Nannie or Nancy or ? On December 17, 1889 in Hardin County, Kentucky, Frances Isabelle Marriott, "Frankie", married Benjamin Hardin Alvey, Sr., son of William Madison Alvey and Laura Ann (Medley) Alvey. Benjamin was born January 6, 1865 in Hardin County, Kentucky. By 1900, Frankie and Benjamin were living at Louisville, Kentucky, where Benjamin was working in dry goods in 1900. 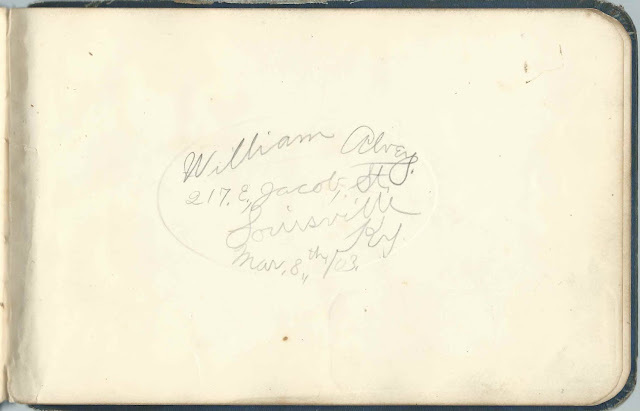 The family had expanded to include four children, two of whom, John Marion Alvey, Sr., and William Benjamin Alvey, inscribed pages in their mother's album, as noted above. The other children were Charles Raymond Alvey; Laura Elenor Alvey; Horace Hinton Alvey; Lucile M. Alvey; and Benjamin Hardin Alvey, Jr.
By 1920, Benjamin was manufacturing the automobile tops for which he had received a patent about 1917. Benjamin died in 1938 and Frankie in 1961. They're buried at the Cave Hill Cemetery at Louisville, Kentucky. One page contains a sketch of a mustached fellow. The facing page was inscribed by W. T. D., but I don't know if there's a relationship between the two pages. Kerfoot  Lee M ? Partridge S ? W ? Initials too hard to decipher, inscribed on April 5, 1881. Surname might begin with M., perhaps meaning Marriott. 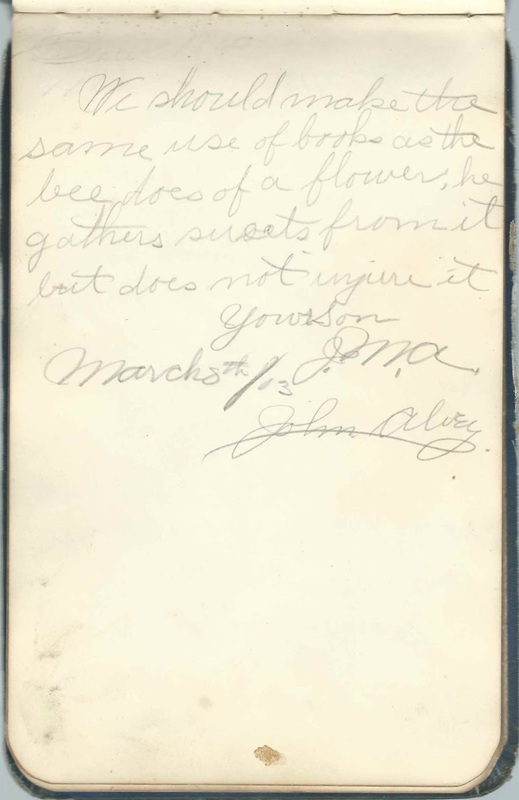 Unsigned: "Remember that today will never dawn again"
Elmore, inscribed on January 30, 1882; Frankie's "little cousin"
Sudie Alvey of Cecilian, Kentucky, inscribed on July 26, 1886. Shared the page with Horace Bethel. William Alvey of 217 E Jacob St, Louisville, Kentucky, inscribed on March 8, 1903. 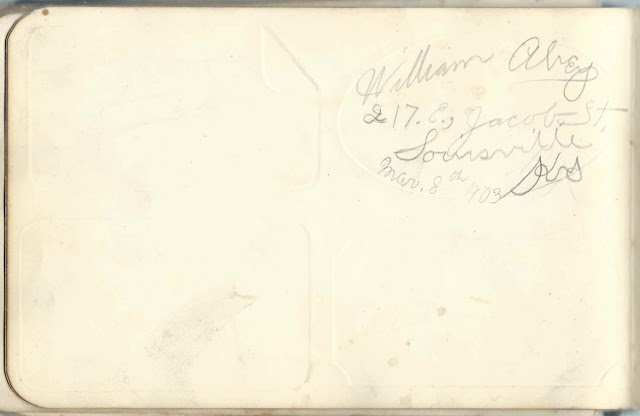 Frankie's son William Benjamin Alvey (1892-1975), who inscribed two pages. 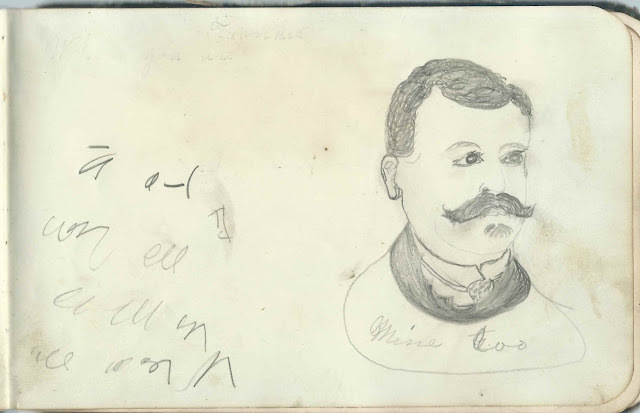 W. T. D.; not sure of middle initial; sketch of a mustached man on the facing page, but I can't say for sure that W. T. D. sketched it. 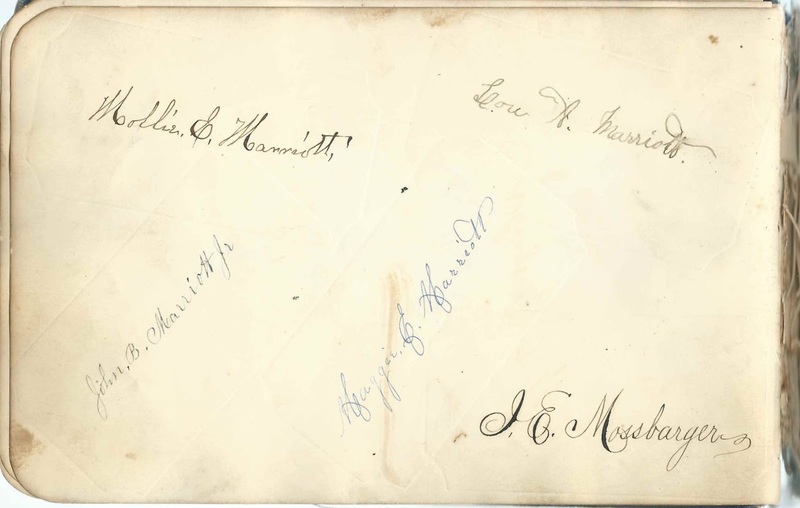 M. B. M.; "your schoolmate", dated April 9, 1887 or 1881. Frances Isabelle Marriott of Hardin County, Kentucky; album owner, nicknamed "Frankie"
Lizzie Marriott; "Your loving Sister". Signed in two inks, presumably at different times, one being dated March 6, 1886 [no sure of year]. Elizabeth M. Marriott, who would marry Willis Woolfolk Long. She inscribed other pages as well, on shared and individual pages. E. Maggie M., "your sister", inscribed on April 9, 1881. Presumably Margaret Ellen Marriott (1854-1954), who would marry Henry A. Sutzer. 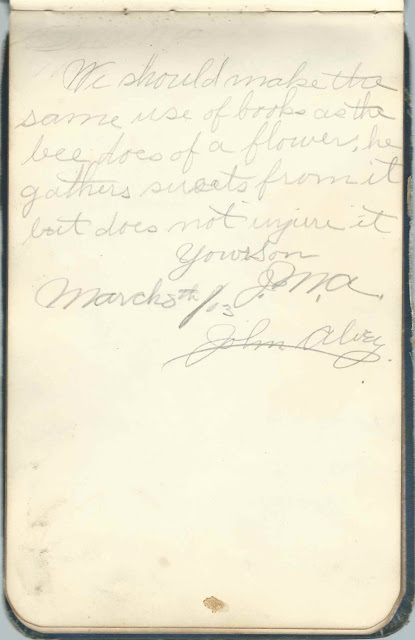 J. W. Marriott, inscribed at Nolin, Hardin County, Kentucky, on February 18, 18? J. O. Marriott; "your cousin"
Ella Miller, inscribed at Cecilian, Kentucky, on December 14, 1887; "your little cousin"
Louise Smith, inscribed at Munfordville, Kentucky, on August 14, 1884; "your cousin"
Laura Sullivan, inscribed on April 12, 1881; "your school-mate"
Ada A. Sullivan, inscribed on March 21, 1886. Shared the page with Horace W. Bethel.